Russia's 'gay propaganda' law protects children, Graham said on a recent visit to the nation. 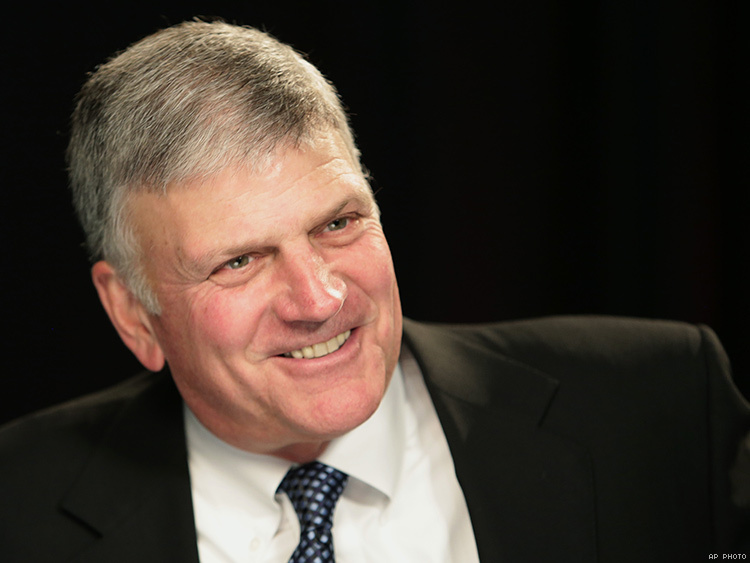 Conservative Christian evangelist Franklin Graham, on a trip to Russia last week, praised President Vladimir Putin and the nation’s so-called gay propaganda law for “protecting Russian young people” and criticized LGBT-accepting U.S. churches as well as President Obama. Russia’s “propaganda” law, enacted in 2013, prohibits “promotion of nontraditional sexual relations” — basically, anything that portrays LGBT people in a positive light or endorses LGBT equality — in venues accessible to minors. Now Graham will seek to influence the U.S. political process with a 50-state tour beginning in January. He will not endorse any candidate but will “ask Christians to pray for the country, vote for people who hold biblical values and run for public office at every level,” according to a press release on his group’s website. His first stop will be in Des Moines January 5, about a month before Iowa holds its presidential caucus. He has other January and February stops scheduled in early primary states such as New Hampshire and South Carolina.